Former U.S. 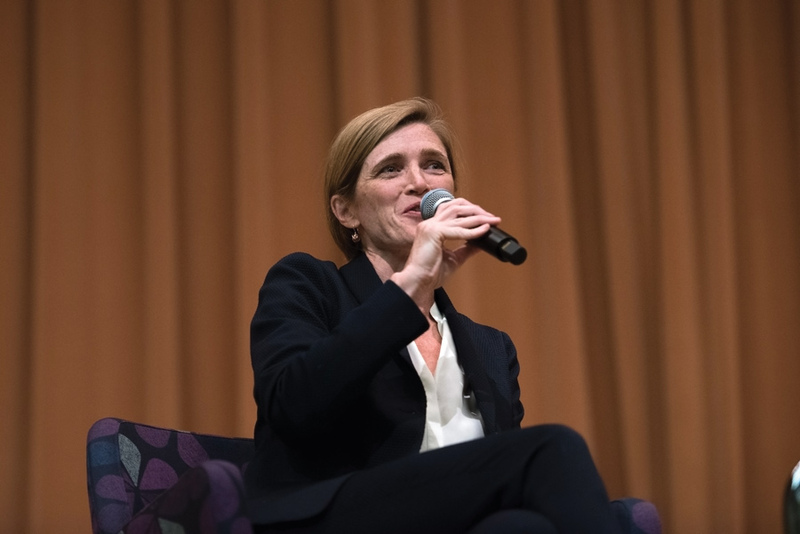 Ambassador to the U.N. Samantha Power speaks at an event in Technological Institute Monday. During the talk, Power spoke about her time as a diplomat and journalist. Former U.S. Ambassador to the United Nations Samantha Power met with every other U.N. ambassador during her four-year tenure. She said about 45 had never been visited by one of her predecessors. Power looked back on her career during a conversation Monday hosted by the Contemporary Thought Speaker Series, Global Engagement Summit and the political science department. In front of more than 100 people, Power discussed what led her into politics with political science Prof. Wendy Pearlman, who moderated the event. Power emigrated from Ireland when she was 9 years old. She attended Yale University, later becoming a freelance correspondent during the wars in Yugoslavia in the 1990s. She said she was inspired to go overseas as a journalist after she opened The New York Times and saw a picture of emancipated men in Europe, reminiscent of the horrors of the Holocaust. Weinberg freshman Esteve Botella i Valls told The Daily that the story behind Power’s career stuck with him. “It was important that she placed idealism and the strive for human rights as an uttermost idea behind all of her experiences,” Botella i Valls said. Power also served as a senior adviser to President Barack Obama during his 2008 presidential campaign, then as a member of the National Security Council. When reflecting on her career, Power said she regretted that the U.S. couldn’t find a definite solution to conflicts in Syria. However, she pointed to U.S. leadership during the Ebola outbreak in 2014 as a time when “reason won over fear” and the government offered “concrete” solutions. Looking forward, she said the U.S. should avoid isolationism and instead accept its influential role in the world by participating in global organizations. As the future leaders of the world, Power said she encourages students to take the time to look at issues in-depth. Communication sophomore Sydney Monroe told The Daily that Power’s expertise and passion showed throughout the conversation, which lived up to Monroe’s expectations.